Hiking Rocky Mountain National Park: The North East Corner of RMNP. I was at a loss a few weeks ago. What to do? Trail Ridge Road had closed for the season, and remarkably, I have nearly climbed out the entire east side of the park. I'd done some research on the North Fork area, but it looked like trails were still closed. No big surprise, as this region sustained some of the heaviest rainfall during the flood. I hadn't hiked in over a month. Pretty incredible for me. I decided to go for the shorter of the options from this trail head. 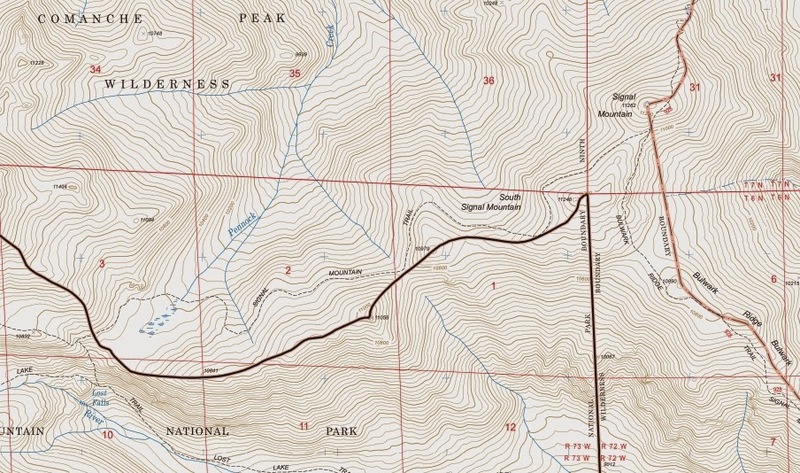 That being North and South Signal Mountain, the ranked but unofficially named Pennock Peak (not included in Fosters book), and Bulwark Ridge's high point. To get here, take 34W towards The Stanley Hotel from the 36/34 intersection in Estes Park. Take a right on McGregor Avenue, which turns into Devils Gulch Road. Continue on this through the town of Glen Haven, and take a left on Dunraven Glade Road. Continue to the end of this road for parking. On foot, you will pass by the white gate and head uphill to Camp Cheley. The Bulwark Ridge trail is on the right here. This little hill gets the heart racing, and it raced more when I saw eyeshine! But it was nothing more than inquisitive deer watching me in the early morning darkness. A short time later, morning had come and the headlamp came off. Four miles to Signal Mountain. Easy. After the initial gain, the trail is rather level for a time, but knowing how much elevation gain I'd need to do over those remaining four miles gave me the insight that things would soon be steeper. It was great to be back in the forest for sunrise. A place of peace and mediation, so quiet I could hear only my breathing and the pounding of my heart. And the aromatics of the soil and the smell of the trees as they are kissed by the first sunlight of the day is like nothing else on earth. The summit of Bulwark Ridge lies at 10890 feet, and was relatively easy to find despite not seeing a trail to it. Pretty much continue until you can see Signal Mountain and the trail starts to loose elevation. Turn right and find the highpoint. Pretty easy. This gives you some great views in the the North Fork Basin. And of course towards Signal Mountain. I found the remnants of a glass summit register on Bulwark Ridge, but no paper was seen. For here, I headed back down to the trail and onwards and upwards to Signal Mountain. Only 300 feet or so of elevation gain to go! The trail skirts by south east of the summit, so I left it and headed for the top. The view of South Signal Mountain from Signal Mountain. The register here was fairly young but pretty awesome- it is certainly worth taking the time to read some of the entries on your visit. Dundicking, Dunraven, Mummy Mountain, and others lost in the clouds. Stormy Peaks and Little No Name on the left. Pennock Peak is almost directly center here, in front of some of the higher peaks in the area. This peak lies at 11058 feet, just above tree line. While I didn't see a distinct intersection on the way up, I could see the faintest of outlines of a trail heading west. 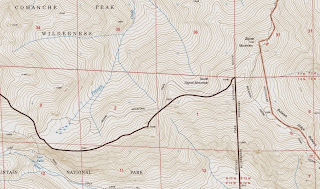 Interestingly enough, I didn't see a trail on the map in Fosters book, but there is definitely a trail there on Caltopo. Above treeline, this was just some mashed down grass and the occasional cairn. The "trail" is very faintly visible here, looking back to Signal Mountain. Along the way, I saw several of these dried plants sticking up from the ground. At first I thought they were Pinedrops, but upon looking at some photos online, I'd say they are something else, thought they do look similar. Pretty interesting looking either way. Once I reached treeline, the trail became a little bit less distinct. It was somewhat difficult to follow at times, but if you have some experience, you will be able to find the small visual clues and follow it along. I can see why it was not included on the topo in Fosters book. In the end, I went slightly past Pennock Peak before making my way directly up the north west side. The views of Signal Mountain and South Signal Mountain as seen from Pennock Peak. Gibraltar Peak, Middle No Name, Little No Name, and Stormy Peaks as seen from Pennock Peak. You can see the posts marking the RMNP/Comanche Peak Wilderness boundary here. Despite these peaks being in RMNP, I technically spent very little time in the park on this day. Rather than go back the way I'd come, I simply headed east towards South Signal Mountain. I spent some time doing some easy bushwhacking before refinding the trail, though it is so indistinct I almost missed it. Pennock Peak and the North Fork drainage. I happened by this tree along the way. The right half was dead, but the left side was still quite alive. I skipped the thin trail once I got back up to treeline and headed directly toward the summit of South Signal Mountain. I found it very difficult to tell where the true highpoint was, and kept scrambling up piles of rock and thinking, "No, that looks higher." The topos have the true summit to the west. But in the end, I decided this shelf of white rock to the east looked like the highest point. And of course, upon standing on top of it, the points to the west looked higher. Well, where ever the summit is, I stood on top of it. You can tell which way the wind comes from pretty easily. I made my way down over some rocky terrain until I hit the Bulwark Ridge trail and started back down. I could see Longs Peak most of the day, and it was in and out of clouds. The trail on the way down. I went past the highpoint of Bulwark Ridge before heading back down the trail. The steepness and looseness of parts of the upper trail will likely keep you from going too fast, but once you reach the flats you can really move. I got a great view of Dunraven Glade Road from the top of the final descent. There were a few vehicles in the parking lot, though I didn't see a single person all day. Signal Mountain and its south summit are certainly worth the trip. I tend to like the less busy places in the park, and I think even on a summer day you wouldn't run into a ton of people here. There is enough elevation gain to keep things difficult but not too much so, and making your way to Pennock Peak would certainly be a good exercise in route finding for those of you looking to move in that direction. Remember to look for the small things- cairns, flattened grass, erosion on the ground. Great views abound from the summits of any of these peaks, and there is a true sense of wilderness and isolation. Pennock Peak, 11058 feet: 8.5 miles each way, 3158 foot gain. Strenuous-. As a whole, this loop had me gain around 4700 feet of gross elevation over 15.5 miles. Strenuous-.